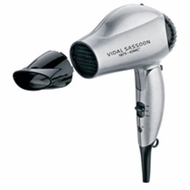 Vidal Sassoon 1875W Ionic Travel Dryer features Ionic Technology for shinier hair, more volume and less "frizz". The ion switch turns hair-conditioning ions On or Off. The Cold shot button sets the style after drying. This item is easy to store with a folding handle. It also features 2 heat/speed settings and airflow concentrator. It has worldwide dual voltage for use anywhere. For shinier hair, more volume and less "frizz"